Electric fencing can be run around wooden permanent posts, plastic polyposts, and metal pig tail posts, or along the top of walls or fences. The spacing of the posts depends on the type of post you are using, the type of animal you are containing and the contours of your land. In general, you want to ensure that your electric fencing tape, rope or wire is kept taught and not sagging or flapping in the wind. There is an ‘art’ to electric fencing, so please only take the information below as a guideline. The key is to ensure your electric fencing barrier is supported. If in doubt, add more posts because it will only serve to strengthen the fence! 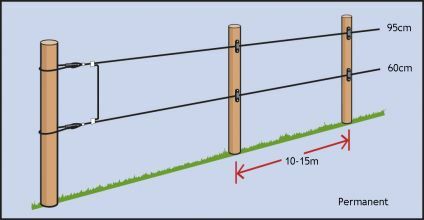 For electric fencing polypost spacing, the general rule is that they should be spaced no more than 10m apart. If you have undulating ground, you may need to have the posts closer together to keep the tape or rope supported. It is a good idea to have wooden posts on the corners, if possible, to add a little strength to the fence but most people do not have this luxury with their temporary electric fence. Wooden permanent posts can be placed every 10-15m apart, but again may need to be closer if you have undulating ground. If you are thinking of getting an electrified poultry net, the net will come with posts already spaced appropriately. Typically, poultry posts are spaced every 4m, although if you have an area where you feel you need an extra post, you can always get spare posts and insert them into the poultry netting. The fence posts only serve to support your electric fence and have no bearing on how well the fence performs. The benefit of plastic posts are that they are inexpensive and easy to install, they have the insulators built into the post and they can be easily moved, should you wish to change the format of your electric fence. However, be cautious because there are different qualities of plastic polyposts. We have a ‘standard’ and ‘superior’ posts, both of which are manufactured in the EU and are very reliable. Some posts, typically made in Asia, can bend and become brittle in the sunlight. Wooden posts are expensive to install, but are the strongest option and, some may argue, the most pleasing to the eye! If you have horses who rub against the top of the rail or chew the rail, you can easily prevent this with electric fencing running along the top of your post and rail fence. Please remember that you MUST use insulators and ensure that your electrified tape, rope or wire never touches the wooden post – if it does, the electricity will run off the wire, through the wooden post and into the ground rendering your electric fence weak or useless. These fence posts have a molded foot and a thicker longer spike giving extra strength to the post.